Looking for some wanderlust or a spot of travel inspiration? 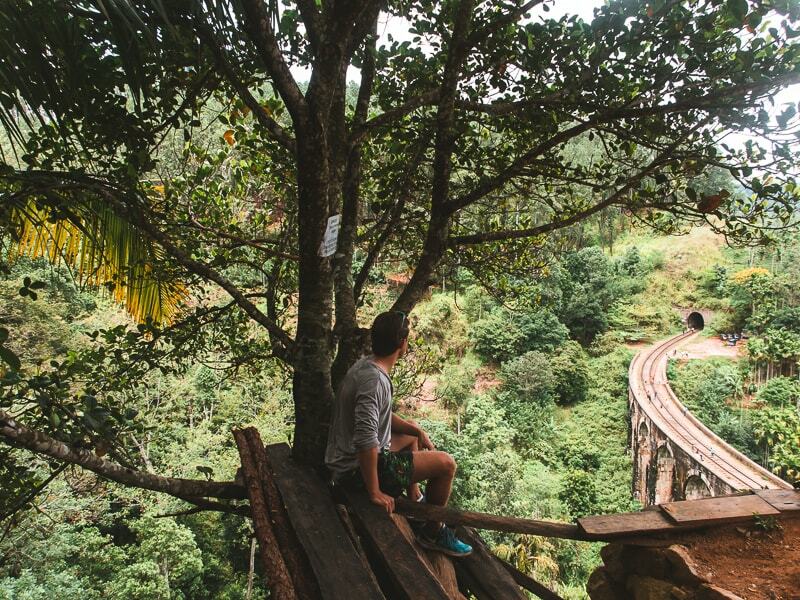 Well, here's our go-to list of the top 14 things to do in Ella (Sri Lanka). Don't miss any! On our 4 week backpacking trip through Sri Lanka, one of our most highly anticipated stops was Ella. We’d seen it in numerous Sri Lanka itineraries and knew there were so many incredible sights to see and moments to capture. And guess what … it lived up to expectations, and more! We had a truly incredible time exploring all of the wonderful things to do in Ella, and thought it best to share our experiences with you. If you’re an Instagram fan, there’s a good chance you’ve seen Ella bridge before. It’s a famous photographing spot due to the gorgeous, old-school design of the bridge and the surrounding green bushes and trees. When you dig into the history of the bridge, you once again discover the heavy influence the British had on the region. It’s in Demodora, halfway between Ella and Demodara Railway Station and Ella Railway station. I recently found out that there’s a chance this famous bridge was once meant to be constructed of steel. However, due to WW2, Britain was forced to redirect all steel production to the war effort. As such, local engineers were forced to construct the bridge from stone and cement. 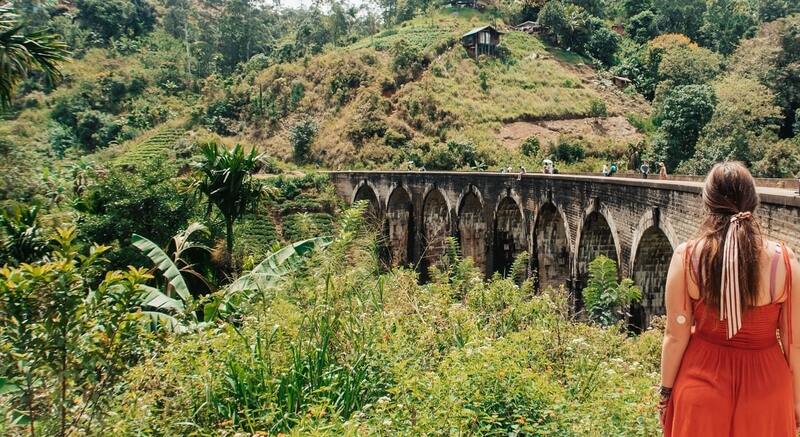 Well, it’s hard now to imagine the Nine Arch Bridge in Ella looking any different to how it does today! 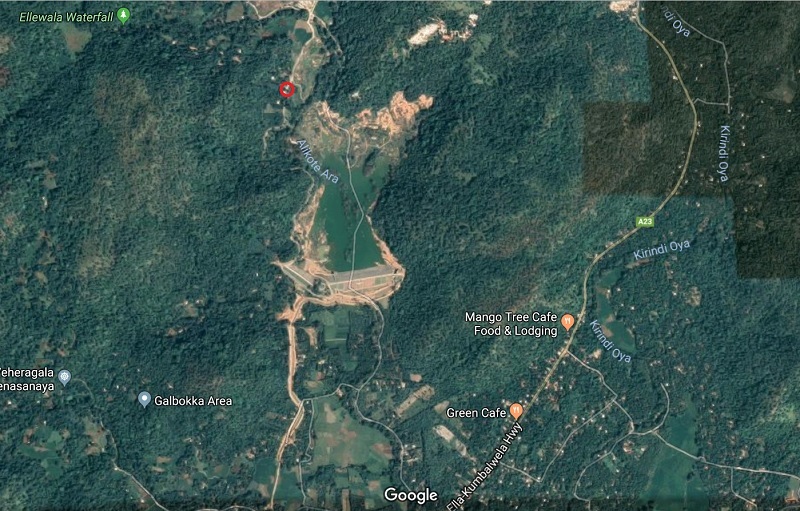 Like most things in Sri Lanka, we always tend to use Google Maps when planning our route. And indeed, if you type in “Nine Arch Bridge” into Google Maps, it will take you there, albeit via a rather tricky way. Even if you take a tuk tuk or moped, you still have to walk down some small rocky, muddy paths, literally walking next to people’s homes. After doing this once in the middle of the day, we ended up arriving hot, sweaty and tired! Oh yeah, and the bridge was full with people! First off, you will need your own mode of transport. You can walk, but it might take you roughy an hour to get there from town. And though it then ends on Google Maps, there is in fact a whole network of roads that extends beyond this point, filled with homes and businesses. Once you reach that point, keep going straight and then you turn right when you see a big white faded sign that says about the Nine Arch Bridge. Then follow that road straight, until you have one more right turn up a steep winding road. Again a big white sign marks this spot, however it is almost entirely faded. It sounds hard to find, but it shouldn't be. We found it first time with less instruction that what is given here. As you drive along, you’ll find tonnes of locals who can point you in the right direction. We drove up there in a tuk tuk, but a moped should do the job as well. Alternatively, just hire a tuk tuk driver to take you. It would only cost a few hundred rupees per person and they should take this route. Also, I recommend doing what we did and arriving there at around 6am. That way, the sun is up and no one is there. You can then capture the best shots imaginable. For us, the first train came at around 6:40am. But this can change. So speak to a few locals in town and ask for a rough idea of when the train should be passing by. Just don’t miss it as they only run once every hour or so. Have fun! Little Adams Peak is nowhere near as challenging as the famous “Adams Peak” in Nuwara Eliya. However, it still offers breathtaking views of the valley below. It takes around 15 minutes to climb up, and you then have a ridge to walk along, and can choose to climb down and then up a final peak. The views all the way along are incredible, so it’s a nice place to relax and take some shots. Many people take food with them up the mountain and then enjoy it with a view. As you drive up to Adam’s Peak, you go through a resort called 98 Acres Resort & Spa. It is by far the most expensive resort in Ella, however, the restaurant is open to the public and is surprisingly reasonable! 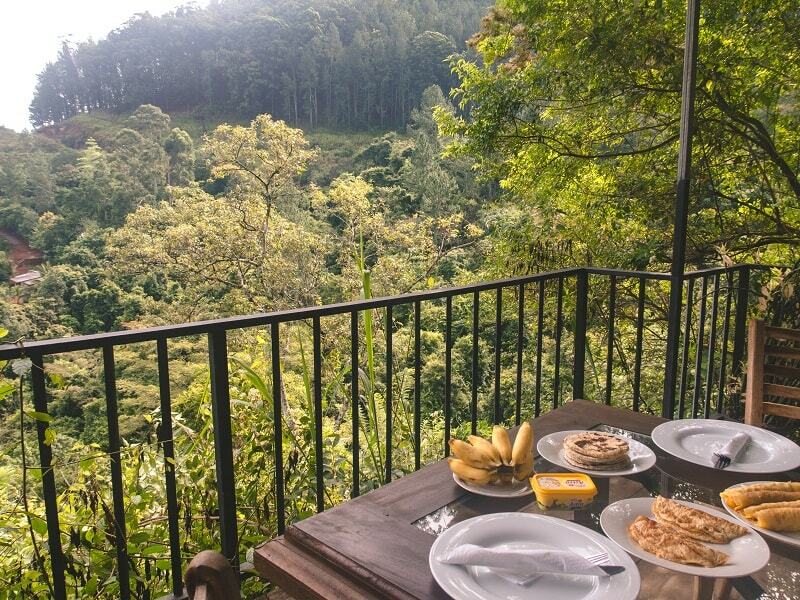 For around 800 rupees, you can have a meal in a fancy restaurant that offers views of Adam’s Peak. It’s a nice reward for the slightly arduous climb in the hot sun. Our view of Adam's Peak from the 98 Acres restaurant! Now that you’ve completed Adam’s Peak, it’s time to take on a real challenge! Ella Rock is the ultimate hiking opportunity in Ella and offers the best views you’ll find anywhere. That is of course as long as it isn't too foggy. In the busier months this is less of a problem. However, for us, in October the mist always seemed to arrive at the wrong time! You can get a guide to take you up the mountain or walk it yourself. As it is a bit of a confusing trek and the locals often cover up true markers to the top, I recommend checking out this guide on how to get there. About 15 minutes from Ella you have Ravana Falls. These are perhaps the easiest waterfalls to get to in the area as they are literally at the side of the main road you drive down. You can walk up to them and stand at the edge of the flowing water beneath the falls. Some people also choose to swim in there, though it is incredibly dangerous. In fact, there is a giant sign at the base of the falls informing you that more than 30 people have already died there. Whilst visiting Ravana Falls, you might as well take the time to visit the cave there as well. To get there, you’ll need to climb up more than 600 steep, awkwardly cut steps. However, the journey is certainly worth it. Though not a big cave, it is steeped in local folklore. Rumour has it, King Ravana once used it to hide Princess Sita, whom he had kidnapped. Their story actually involves many of the local sites in and around Ella and Nuwara Eliya. So if you’re interested, then you can read up on it here. 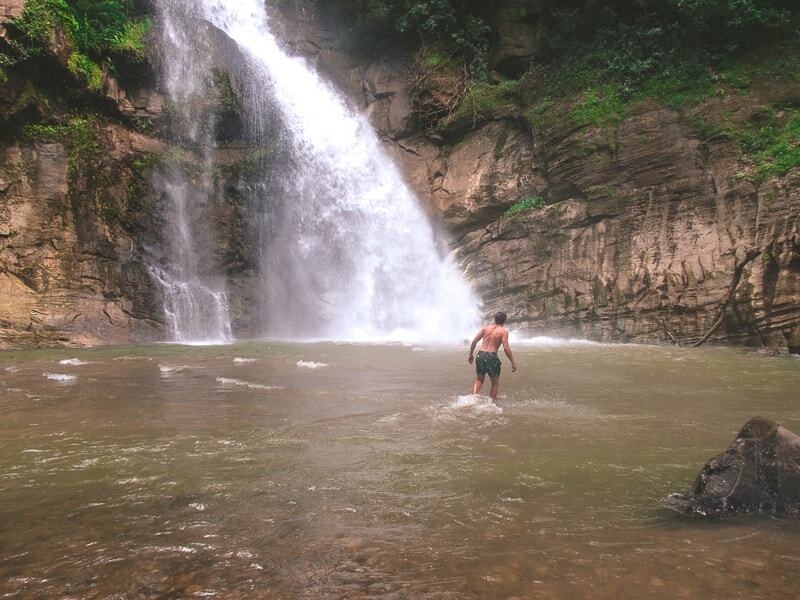 Once you’ve been to Ravana Falls, you can then carry further on down the same road until you reach Ellawalla Waterfall. This is a wonderful little spot, located away from the main road and far more secluded. To get there, I’ve screenshotted where you need to drive up. It’s not particularly well signposted, but is perfectly accessible. Once you reach the point shown below, you’ll find a small cafe area and local guides. They will show you the way to the falls, which is less than a five minute walk from where you parked up. What’s great is you can also swim in these falls, and the power of the water is incredible! Once you get to the red point marked on the map, simply head left and up the dirt road. There are locals living there who will be able to direct you. It’s simply that Google maps hasn’t yet updated seeing as the reservoir built there is still relatively new. 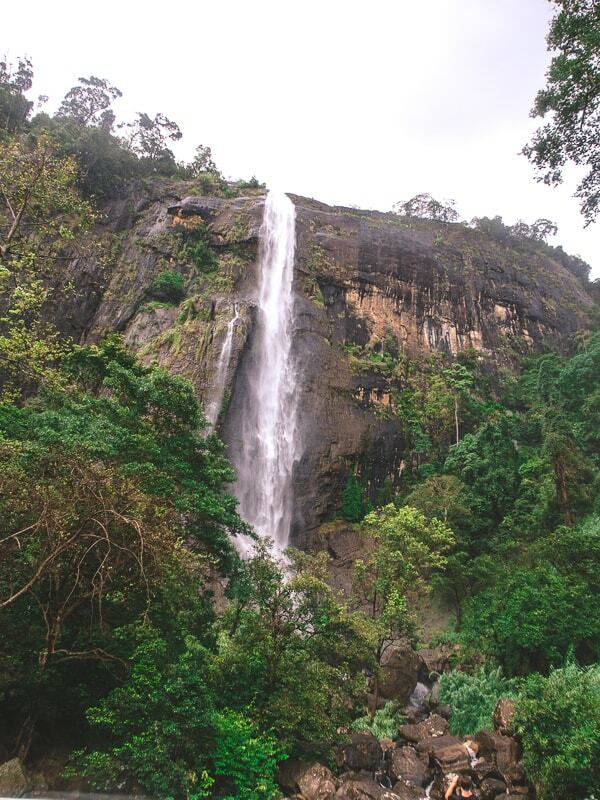 Diyaluma Falls are some of the most spectacular waterfalls anywhere in Sri Lanka. Which is not really surprising seeing as they are also the second highest. Just live Ravana falls, you can see Diyaluma from the side of the main road. There are a couple of small cafes there where you can stop and take some nice pictures. Sadly for us, it started absolutely hammering it down with rain, literally the very second we arrived there! It was the worst timing ever, so we failed to get the sorts of pictures we’d have liked. 8. Swim in them from above! 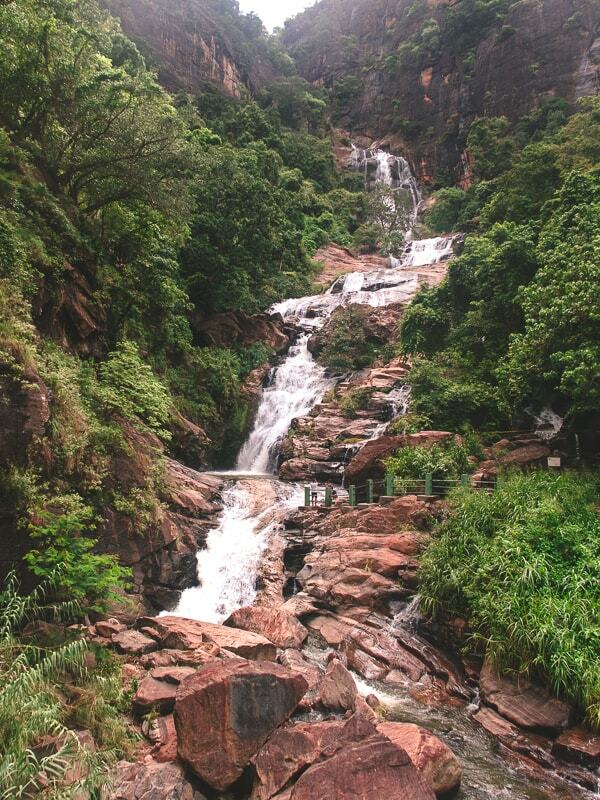 Once you’ve seen Diyaluma Falls from below, it’s time to see them from above! You just keep heading down the road you came along and then turn right a few hundred meters down. You then drive up the mountain for about 10 minutes until you reach the top. Here, you can get out and walk up to and swim in the many pools of water. Sadly for us, by the time we reached the top the rain had got even worse! So we couldn't go up to them or we would have literally been soaked to the bone with more than an hour's drive back in the pouring rain. Definitely my biggest regret from being in Ella was being so close yet not being able to swim in them! Ever heard of Lipton Ice Tea? 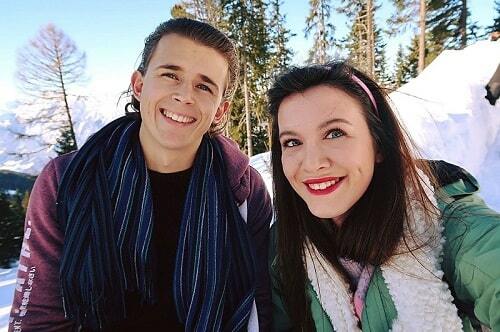 Well, this is where it all began! Sir Thomas Lipton owned acres worth of tea plantations in the area and Lipton's Seat was where he used to go to survey his tea empire. It is about a 7km walk up to the top. However, you’re not expected to do this anymore! Instead, many traveller choose to get a lift up to the top and then walk back down. That way, you get to appreciate the spectacular panoramic views and have the chance to take in the rest of the views on the way down. If you’ve made it all the way to Ella and still haven't been to a tea factory, then that’s about to change! It's one of the best things to do in Ella when it’s raining, as you can explore the factories and relax in the cafe all whilst the rain hammers around you. And they're even better when it’s sunny as you can find one with amazing views out across the surrounding plantations. It’s hard to suggest any one factory to go to. But perhaps the Halpewatte Tea Factory is the most popular (and the largest) in the area. If you’re looking for things to do in Ella at the night, then you have just one real option … hit the town! 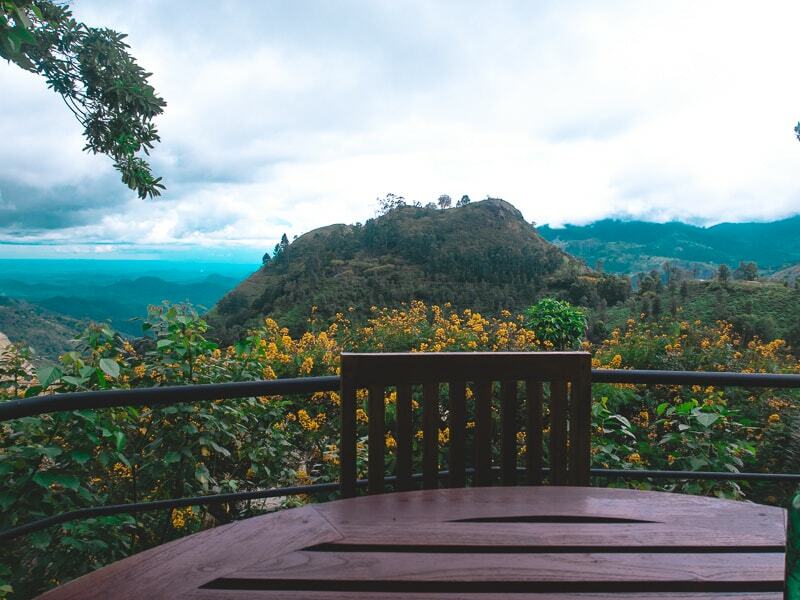 Compared to other major tourist locations in Sri Lanka, Ella seems to be one of the most young and alive spots to be. Though the main town is anything but big, it’s lined with a variety of different bars and restaurants. Best of all, they are all incredibly cheap and offer cheap cocktail deals late into the night. We most liked Ella Spice as it has a very modern vibe, excellent selection of food, cheap cocktails, a pool table and live music. And whilst we were there, it seemed to be ladies night every night! Where between 6 and 8, all women get 2 free cocktails. Sorry gents, it’s simply not fair. 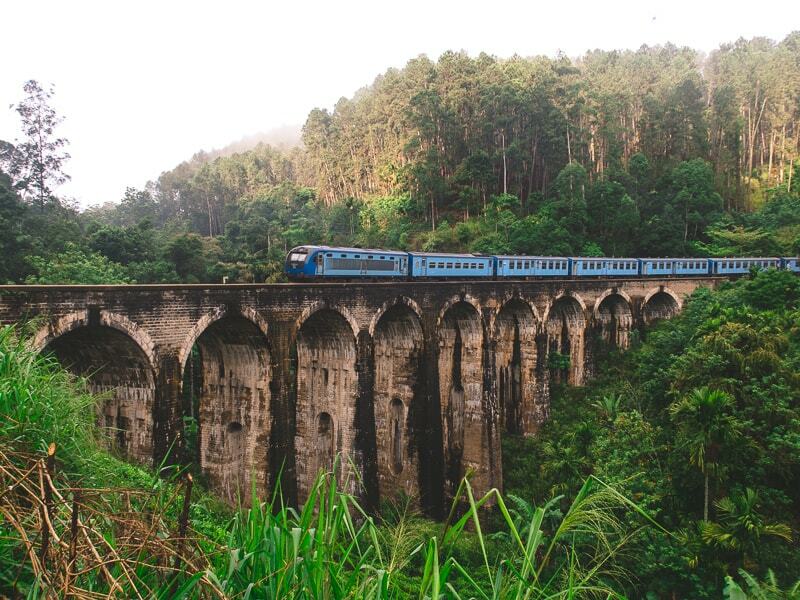 The Kandy to Ella train journey just so happens to be one of the best things to do in Ella, Sri Lanka. And is also the most famous train journey anywhere in the country. 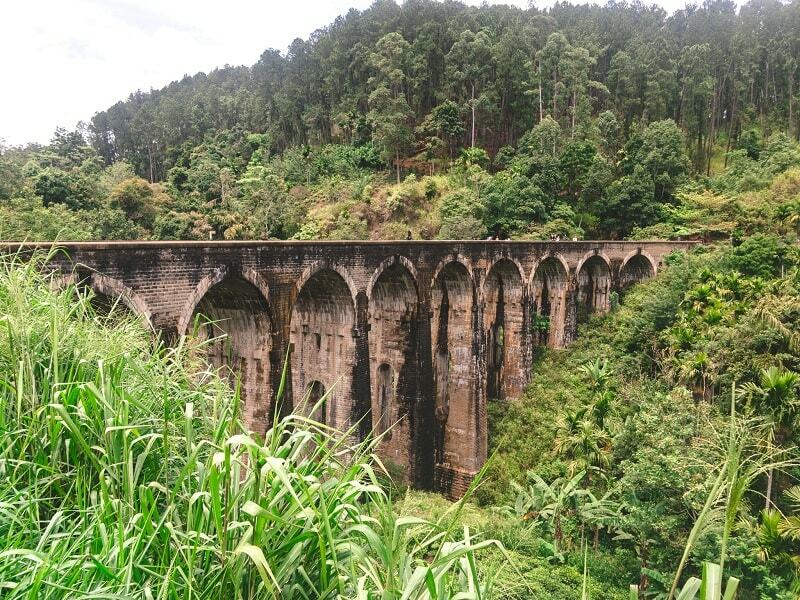 The route takes you through vast open tea plantations and is the perfect way to take in the local landscape and fill up your phone with Instagram-worthy shots. It takes about 4 hours in total, and you can enjoy the journey in either direction. As we had a tuk tuk, we didn't take the train. But still got to see all of the same spots by road. For advice on catching your train, here is a guide for you. The entire region around Ella seems to be filled with gorgeous tea plantations. So one of the best things you can do is simply stop off somewhere nice and go for a stroll. You shouldn't have to worry about any fences, as the entire area is open. You’ll also get the chance to meet many local women out picking tea in the fields. Finally, why not learn how to cook up some local cuisine whilst you’re in Ella? Your experience starts with a short tour of the spice garden where you learn about local spices and ingredients. Afterwards, you head inside for a lunchtime cooking experience, and you also get to eat what you make and take home a recipe book afterwards. You can find out more here. Just be sure to book your spaces early as it sells out fast in the peak months. How much will you need to budget in Ella? Everywhere in Sri Lanka is surprisingly cheap. And, despite Ella being such a famous spot, it still follows this same rule. If you’re eating out, then expect to pay anywhere from 600 rupees to 1000 rupees for a nice meal in somewhere like 360 or Ella Spice. Drinks are cheap, just make sure you head out during happy hours. Though these seem to run all the way up until 10pm in many places. Getting around by tuk tuk is cheap, and locals are very fair. In fact, we needed to replace a tyre on our tuk tuk whilst in Ella. We asked 3 local tuk tuk drivers to help and they ended up doing it all for me. When I tried to give them money they all outrightly refused. It’s nice that no one there is out to rip you off. Hostels and hotels are also very reasonably priced, and there's now loads of great accommodation in Ella to choose from. We recommend using Booking.com as they have an incredibly big variety and offer the best prices. Here’s a selection of some of the best places to stay in Ella. With so many amazing things to do in Ella, you're probably left wondering how on Earth you're going to get to them all! 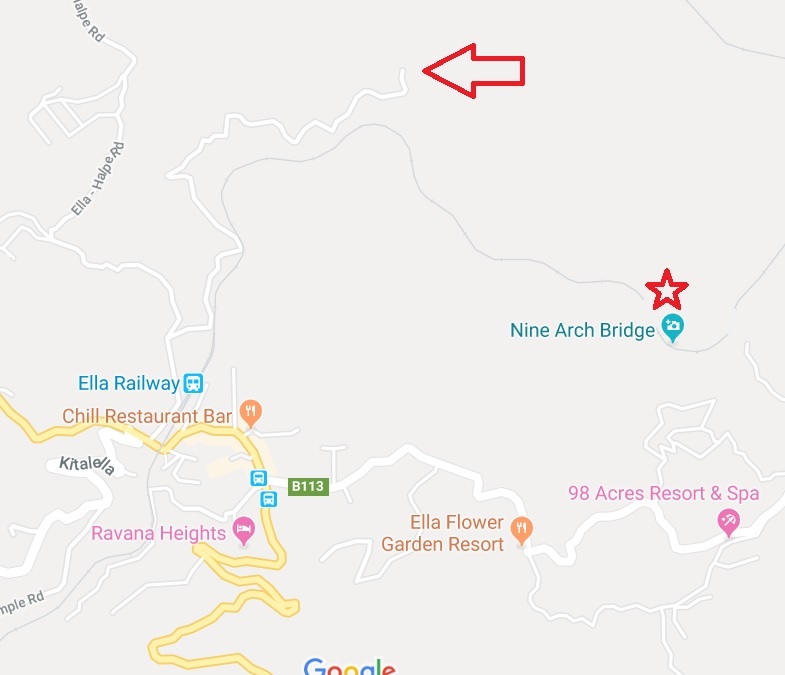 Well, things like Adam’s Peak and the Nine Arch bridge are all within walking distance though the round trip will likely take you a good 3 or 4 hours. In the sun this will be extremely tiring. As such, I recommend sorting out your own transport. We had our own tuk tuk which we used, but there are places in town renting out cheap mopeds for the day. Just be sure to give your bike a good check over before taking it. Alternatively, you can hire a tuk tuk driver for the day to take you everywhere you need to go. I can't comment on exactly how much this would be, but I strongly doubt it would be very much. And it would be nice having a guide to talk to and answer some of your questions. Well, that's about it! If you have any recommendations on other things we might have missed whilst there, just drop me a comment below. Have a great time! Looking for some great tours in Ella? 12 Best Things To Do In Unawatuna (Sri Lanka) 2019 And Beyond!